Joe Palooka embodied everything that people value--honesty, politeness, gentility--wrapped up in a surprising package. 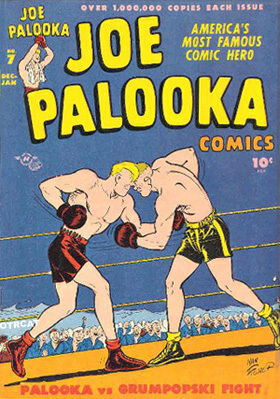 "1932 Championship Fight with Quinn Jones"
Joe Palooka started out as a comic strip drawn by Ham Fisher beginning in 1921 but didn't appear in papers until 1930. 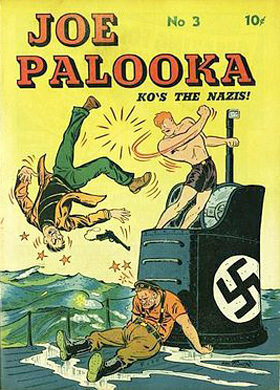 There were many products around Joe Palooka like lunch boxes, a board game, a watch, and even a Wheaties Box. He even made it to television and movies. In 1932, network radio brought Joe to radio in a short-lived series that was on the air from April to August 1932. The comic strip featured, Joe; Joe's manager Knobby Walsh; his girlfriend Anne Howe; blacksmith Humphrey Pennyworth; and mute kid sidekick Little Max. The radio show included Knobby Walsh and Anne Howe. Broadcast on Tuesdays and Thursdays for 15-minutes, the show was sponsored by Heinz Rice Flakes. In 1945, after five years fighting the war, Fisher decided it was time for Joe to have some adventures after the war. Joe was very popular with the soldiers, so popular that the government used Joe in all kinds of documentation. Fisher wanted to capitalize on that popularity and bring Joe back to radio. He formed a production company and recorded two demo shows but failed to sell them. Still believing that a radio show was feasible, Fisher went to North Central Broadcasting who agreed and recorded 26 weeks of daily shows. Unfortunately, North Central declared bankruptcy and Joe never made it back to radio. This collection contains the only two episodes known to be in existence of this classic old time radio show. Be the first to comment on "Joe Palooka"